Which faces are we not seeing? Who in the community is not coming into the branch? 40% who are non-library users. This last group, non-library users (or underserved community members) are primarily comprised of the ‘hard to reach’ community members who quite ironically are in the most need of library services or are on the polar opposite end of the spectrum, community members who can have made the conscious choice to buy everything they need. 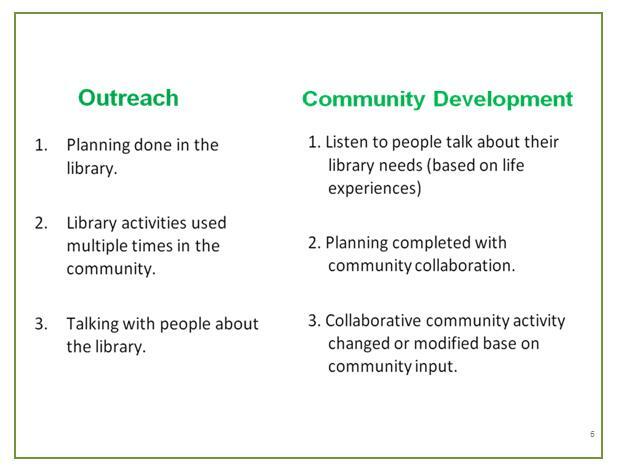 So how do we currently step outside the library and make our resources relevant to the community? Generally, we usually step outside of the library after we have identified a need and a response to the need. For example, we may know that high school students do not know how to use the library catalogue (this is just one of hundreds of traditional outreach examples to draw upon). In response we will developed a catalogue tutorial in the library, take it out to the community (school) to let everyone know how to use it (teach), and talk about what they library has to offer. From a community led perspective we change the order and approach when going into the community. 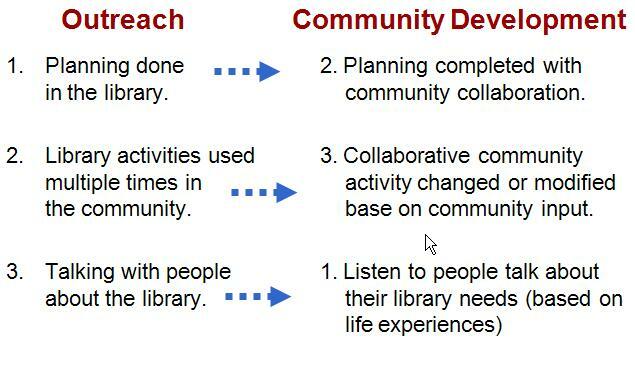 First (after building relationships) we listen to people, plan a collaborative response with community, then change or modify the response based on community input (See picture below). This may or may not be a long and costly process. At times the community led response may actually occur fairly quickly. For example, in Halifax we built relationships with community members at the local food bank and through conversations at the food bank we heard that some of the food was spoiling, because people were not taking it from the food bank. Since the food was rather obscure and people did not know how to prepare it, they were leaving it at the food bank (e.g. leeks, parsnip, pinto beans etc). We knew that there was an information and digital divide in the community, and barriers existed to accessing library services (geography, transportation, fines etc.). We also heard from the community that they do not have a lot of ingredients – main spices included salt, pepper, ketchup, etc. So how did we respond? Based on the community generated information need we collaboratively decided to affix mailing labels with the phone number for the library information desk on the food which was spoiling. Also, library staff created a file on the desktop computer, which linked them to easy recipes, so when community members called they could provide community members with recipes. This opportunity, the identified information need, the service identification, and collaborative response would not have occurred if library staff would not have walked outside of the branch and listened to community need. What are some of the systemic barriers to implementing this approach? Our funders, library boards, and decision makers expectations and perception of role of library may be very traditional. Is your local library viewed as a brick and mortar based institution which only operates, where services are primarily generated (and taken out) within the confines of the physical branch? Are libraries obligated by our funders, community taxpayers, to reach out to those who are underserved by our organizations? As discussed above a majority of money, time and resources are being spent on the 30% of users who know how to use our resources well. Discussions about shifting services can be hard for both staff and the 30% of users. However, we can make libraries and library services what we want – the question remains – what do we want, and what are we willing to try? There may be resources and service we provide which are untouchable – but is everything untouchable? Can a shift in resources occur? Are library systems willing to find and dedicate a few hours a week to explore this approach? (hint) If you do and are having small success, expand – make sure it does not become a ‘few’ community based library workers responsibility, but a responsibility that shared throughout the organization. Fear of failure and experimentation. Everyone wants to succeed at work. However, a community led approach is not a prescriptive approach. We want to discover need and find immediate responses. However, each community is different (e.g. we may go into another food bank and cooking recipes have already been created and are given out). We as library staff like to have answers – quick responses and solutions to community need. What will happen when we go out into the community and do not immediately know how to respond? It is OK, the process is as important as the end result and needs will come..
We learn as much from failure and critical analysis as from success – this takes a dramatic shift in thinking and approaching work. I recently attended a conference where a retired provincial Deputy Minister of Justice discussed the silent killer found within all organizations. It is referred to as ‘Unknown Known’s’, where people are so entrenched in the current structure or culture of the organization (approaches to service), they cannot see anything but what they currently do as being correct. Will we operate in the context of ‘unknown known’s?” or will we allow for innovation – which will come through experimentation, change and conflict. I am wondering if Working Together was such a success because it did provide the latitude to library staff to experiment and try new approaches? As libraries we want to make sure that we are relevant to 100% of our community members. Our current approach to working with community, outside the walls of library branches does not do this. Are we willing to step outside of the library walls, and begin building relationships and collaborating with community members? Was the copyright e-consultation bad for democracy? While yet another bad Canadian copyright bill will be a disappointment, (and approximately round eight-billion of the same ridiculous fight) what really scares me is the impact of this on participatory democracy. There were 8,100 submissions to the 2009 copyright consultation! It was pretty amazing, and manyfold the response to previous traditional-format consultations on the same topic. The online consultation format allowed for public participation on a scale unheard of ever before for such a topic. And if all that participation makes no difference to the bill resulting from that consultation process? If the message the government chooses to give the people is that they laugh in the face of our puny little consultation submissions? That it is pointless to try to contribute our experiences and knowledge to our policymakers? If Geist is corrent in his assessment that “The consultation appears to have been little more than theatre,” Who will participate in the next one? Who wants to waste their time crafting letters that will never be read, or used? What is the point? I fear that the day of the introduction of the new copyright bill will be not only a bad day for Canadian copyright, but a sad day for the future of Canadian participatory democracy. ps – Near the end of writing this post, I went to the copyright e-consultation website and looked for the record of my submission. It was one of the many that came in on the last few days of the consultation, and the office was so bombarded with the overwhelming response that they annouced that it would take a while before they could make all submisisons public. However, I still can’t find mine. Can you find yours? I have a copy of the email, in my sent mail box, and as you know I posted a copy of it here after I sent it off. However, I can’t find it on the consultation website. ??? Are there others in this same boat, still?